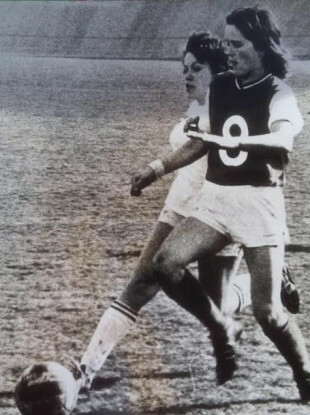 Anne O’Brien was still a teenager when she made history and signed for Stade de Reims. The rest of her story is even more remarkable. Anne O'Brien, a revolutionary football figure but who remains largely unheralded. IT SAID MUCH that when Anne O’Brien died in 2016, it was international news. There was some minor coverage in the Irish media but much more detailed reporting in other countries. In Italy, various outlets paid tribute. One Lazio site prefaced the news with ‘one of our eagles has flown to heaven’. In Trani, the southern fishing town where she won a Scudetto and an Italian Cup, a local journalist, Franco Caffarella, was emotional as he described her talents. “She had class and she had vision,” he said. Her death was heavily covered in Sweden too. At the time, Pia Sundhage – an iconic figure in the women’s game and who was in charge of the US side between 2008 and 2012 – was manager of the Swedish national team. Her and Anne had met in the mid-80s, when Sundhage spent a season with Lazio. She was stunned when informed of her former team-mates’ passing. “Has she gone? I had no idea,” she said. She’d been in Italy for four decades, her journey an inexplicable and remarkable one. “She started playing football from a very young age, on the road in Inchicore,” says Tony O’Brien, Anne’s brother. The deal was historic. No female player from the UK or Ireland had ever played professionally in Europe before. Anne O’Brien was a revolutionary figure. The Stade de Reims team in 1976. Anne is third from the left in the back row. Her manager in France was Pierre Geoffroy, a revolutionary figure in his own right and who had assembled the side along with Richard Gaud in the late-1960s, when there was still a ban in place preventing women from being pro footballers. It was 1970 when the authorities lifted that barrier and Gaud would later comment that despite some misogynistic remarks at the very start of the rebirth, people were amazed by the standard of play. Within a couple of years, a few thousand would turn up to championship games and the club used their new-found fame to begin touring and spreading the word. “Geoffroy felt it was the beginning of something,” Gaud said last year, as Stade de Reims celebrated 50 years since the formation of the women’s team. Anne was a crucial part of the narrative. Bowing to her mother’s demands, she waited until she turned 18 before moving to the north-western city, about 90 minutes drive from Paris. She was big news but seemed completely unfazed by both the move and the attention. “She was in all the papers,” Tony says. “I started playing when I was two years old – as soon as I could walk,” she told reporter Michael Brown, who watched her score against nearby Mourmelon the previous day. Her impact on the team was immediate and she would win three successive French championships between 1974 and 1976. Her performances were so impressive that she was selected for a French League XI for a game against a Rest of Europe side at the end of her debut campaign. “My Ma was in France with her and there are lovely photos of the two of them walking the streets of Paris together,” Tony says. Back in Dublin, the family didn’t carry much worry or anxiety. They felt it was Anne’s destiny of sorts. “She always knew she’d end up in football,” Tony says. In 1976, history repeated itself. Stade de Reims went on a tour to Italy at the end of the season and Anne quickly became a transfer target for Lazio. Their offer of full-time football was too good to turn down so, still aged just 20, she headed for Rome. “The money was much better in Italy,” Tony says. At the end of her first season in the capital, she picked up a Coppa Italia medal after Lazio beat the reigning champions Milan in a shootout. And in 1979, she was a league winner as the Biancocelesti claimed the Scudetto for the first time. The following year, they did it again. Anne was a classic number 10 and part of an immensely-talented side that also boasted the prolific Danish striker Susanne Augustesen and distinguished defender Maura Furlotti. “I would’ve been over a lot to watch her and it was brilliant,” Tony says. During the 1982/83 season, Anne was persuaded to leave Rome and headed for the west coast along with Augustesen to sign for seaside club Trani. She certainly had excellent timing because despite ending the season as runners-up, the side still claimed an Italian Cup before returning in 1984 and winning the championship. It was Anne’s third Scudetto in eight years. She did return to Lazio briefly and racked up another Coppa Italia while she was there but despite inching towards her 30s, she remained in demand. There were stints in Modena, Napoli and Prato and while at the former, she gave birth to a son, Andrea. “She was back playing straightaway,” Tony says. Anne (front row, second from the right) with her Reggiana team-mates. The side were crowned champions of Italy in 1990. Later, there was further success with Reggiana and Milan and when Anne finally called it a day in 1994, she’d accumulated five Scudetti with four different teams. It was an astonishing haul. But, despite being one of the finest players in Europe for two decades, she only ever played four times for Ireland. Once she left for France in the mid-70s, it was a financial and logistical inconvenience for her to be named in squads. So, regardless of her relentless success, she was effectively ignored. “She would always come back in the summer and every Christmas too,” Tony says. Anne did her coaching badges and had stints at two of her former clubs – Milan and Lazio – while she also worked with the Italian Football Federation. Later, she concentrated on coaching local youngsters close to her home by the beach in Fregene, about 40 minutes outside Rome. The family remain immensely proud of everything Anne achieved in her life and Tony, especially, is an encyclopaedia when it comes to his sister’s career. He’s kept every medal, every newspaper clipping, every photograph. He reels off names and addresses that date back more than 40 years. “She went away when she was 18 and she died at 60 – what a life,” he says. Email “'Football was her life - it was all she ever wanted to do': The revolutionary and unheralded Irish icon”. Feedback on “'Football was her life - it was all she ever wanted to do': The revolutionary and unheralded Irish icon”.